Striker Jack Marriott is thrilled to see the fruits of his labour are starting to pay off once more after he played a starring role in Saturday’s 2-1 win over Crewe Alexandra. The 22-year-old was Town’s brightest spark in the first period at Gresty Road, going close on a number of occasions until he beat Ben Garratt at his near post on the stroke of half time. Although the keeper should have undoubtedly done better, it was Marriott’s sixth goal in seven games and took him to nine for the season, already one ahead of his tally at this stage last term, a campaign he eventually finished with 16 goals to his name. The forward, who had been dropped for the recent games against Barnet and Portsmouth, said: “I’ve caught it well and that sort of tight angle, the keepers almost don’t expect it, especially if it’s low and hard and around their feet. “It can be difficult but it has gone in the back of the net and that’s all I really care about. “I know I’ve played more games than I did last year and it has been difficult, but I feel I’m back to my best. “I’ve improved a lot of aspects of my game, I’m constantly working hard and I’m starting to see a few of the rewards. “I do feel quite good. I’m really enjoying my football at the moment and long may that continue. On the goal, boss Nathan Jones said: “When he gets it, he’s got that low centre of gravity and he rifles them low and hard, right near the keeper. I’ve improved a lot of aspects of my game, I’m constantly working hard and I’m starting to see a few of the rewards. 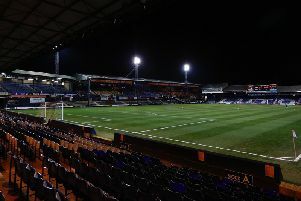 Marriott had been called upon by Jones to spearhead Luton’s attack in the Checkatrade Trophy tie with Chesterfield in the week beforehand. It was the striker’s first appearance in the competition this term, but he netted two clinical strikes to make the most of his opportunity. Marriott continued: “The gaffer wanted me to play and get some minutes. “He said, ‘go out and do the business’ and I thought that I just had to do my best, see if it can get me in the team for Saturday and it has, so it was good. The former Ipswich forward, who now has 25 goals in 72 games for the Hatters, praised strike partner’s Danny Hylton and Craig Mackail-Smith for their help in getting him back to his best on the pitch too. On what he’s learned from the pair, Marriott added: “Loads. The relentlessness that he (Hylton) shows, and it’s the same with Macca, when he plays. “All our strikers are relentless, we don’t stop and Hylts is off the cuff, he’s clever and he produces bits of magic. “He is just fantastic to play with, but you’re constantly learning.